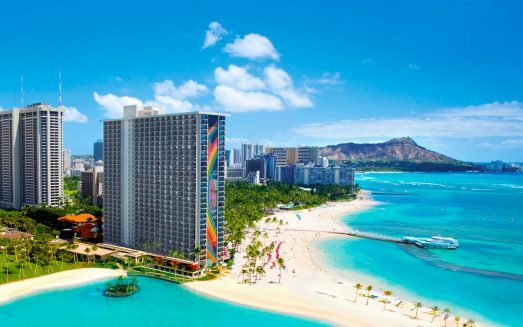 Hilton Hawaiian Village – 5 Star Oceanfront Resort! 2BRs, 1BRs and Studios Available! Huge 2 bedroom 2 bath Villa that Sleeps 6 Comfortably! Also 1 Bedroom and Studio Units Available for smaller parties! Multiple Weeks Available! Oceanfront, Oceanview, and Islandview Units Available depending on availability! Send us your desired dates! Multiple Weeks Available! Oceanfront, Oceanview, and Cityview Units Available depending on availability! Send us your desired dates! Building/Room location cannot be guaranteed as the Hilton will allocate units based upon their inventory control parameters and they manage the occupancy and handle final assignment of units based on requests only with no guarantees. We simply guarantee your check in date, room size and view type if applicable. Upscale rooms offer custom-designed beds and balconies (some with panoramic ocean views), plus minifridges, 37-inch flat-screen TVs and WiFi. Suites add pull-out sofas. Amenities include 20 restaurants and lounges (including an oceanfront steakhouse), a saltwater lagoon, 5 pools, waterslides, a spa, fitness room, business center and meeting space. There’s also a kids’ activity program, snorkeling and hula dancing lessons. The Lagoon Tower two-bedroom suite includes a king-sized bed and a 24-inch TV in the master bedroom. The fully equipped kitchen includes a full-sized refrigerator, microwave, dishwasher oven/stove – plus utensils. A dining area off the kitchen can easily double as workspace. A separate living area features a full-sized sofa bed, a comfortable chair, 32-inch television, DVD player, PlayStation 3 and balcony. The second bedroom has 2 twin beds. Sleeps 6. Disney’s Animal Kingdom Park is only 3 miles – a 5 minute drive!